The 1930’s mark the start of the most successful period of Bologna’s history. Bolstered by the arrival of three Uruguayans (Francis Fedullo, Raffaele Sansone and Michele Andreolo) the Rossoblu looked to start the new decade with a bang, but finished seventh in Serie A’s first year of competition (1929-30). 1930-31 opened with plenty of promise. Bologna smashed Triestina 6-1 in the first game of the season and beat Livorno 5-0 to take an early lead atop Serie A, but their performances slid as the season went on. They finished a credible third, just seven points behind winners Juventus and three from second-place Roma. 81 goals in 34 games made Bologna the league’s second-higher scorers (top-scorer Carlo Reguzzoni finished with 18), and they had the second-meanest defence in the league with just 33 conceded. A good platform for Bologna to build on, and build on it they did. The Rossoblu pushed Juventus closer the following season (1931-32) and finished second, four points behind the Bianconeri and 10 ahead of third-place Roma. Angelo Schiavio was back to his best, and his 25 league goals helped Bologna to Mitropa Cup qualification. The Mitropa Cup was one of Europe’s first international club competitions, and the 1932 edition comprised of Bologna, Juventus, Sparta Prague, Slavia Prague, Admira Vienna, First Vienna, Ferencvaros and Ujpest PC. Bologna beat Sparta 5-3 on aggregate in the first-round, before a 2-1 win over First Vienna secured a place in the final. The final was not to be, however. Crowd trouble in the other semi-final between Slavia Prague and Juventus saw their second leg tie abandoned in the first-half. Rocks were thrown, one striking Slavia’s ‘keeper, and the players were trapped in their dressing rooms for hours after the game as a riot ensued. Both teams were thrown out of the competition, leaving Bologna without opposition for the final. Naturally, the Rossoblu were awarded the trophy. Inauspicious European success aside, 1932-33 wasn’t a hugely successful season for Bologna and they slipped to third in Serie A. They finished fourth the following season but still qualified for the Mitropa Cup after the competition’s expansion. Bologna reached the final, and were given a chance to earn their victory this time. The Rossoblu lost 3-2 to Admira Vienna in the first leg, but a Reguzzoni hat-trick helped them storm to a 5-1 home victory that saw them clinch the trophy. European success was becoming increasingly regular, but domestic gold continued to elude Bologna. They finished sixth in 1934-35 as Juventus hoovered-up another championship. The Rossoblu had established themselves as one of the best teams in Italy, but they hadn’t won a title since 1929. That changed in 1935-36. Bologna sealed their third Italian championship after a highly-competitive Serie A season saw them win just 50% of their 30 games. Just ten points separated first from seventh, and Bologna snatched the title by a single point thanks to a 1-1 draw with Lazio on the season’s last day. Bologna scored just 39 goals all season (Schiavio was their top scorer with 10), but conceded just 21. Theirs was not a stunning victory, but one of grinta and team-work. Bologna repeated the feat in 1936-37, winning Serie A by a more-convincing three points and qualifying for the European Cup for the second season running. 1937 also saw the Rossoblu become the first-ever Italian club to defeat an English club after a 4-1 exhibition victory over Chelsea. Led by Hungarian manager Arpad Weisz, Bologna had become known as “the squad that makes the world tremble.” They’d become the strongest team in Italy, but would have to wait another two years to add to their trophy collection. 1937-38 saw Bologna finish fifth in Serie A but just four points off the top spot. It looked like their dominance was coming to an end, but they returned with aplomb in 1938-39 to record their most convincing championship win yet. 53 goals in 30 games saw the Rossoblu to a fifth Italian title. They lost just four times all season, with Uruguayan hitman Hector Puricelli scoring an impressive 19 goals in his first season at the club. 1938 also marked the retirement of legendary marksman Schiavio, who’d been with Bologna since 1922. Schiavio mustered just six appearances in his final season but retired aged 33 with his legacy in-tact. 242 goals in 248 appearances make him the Rossoblu’s all-time leading scoring and a true club legend. His place in Bologna folklore isn’t just assured: it’s guaranteed. 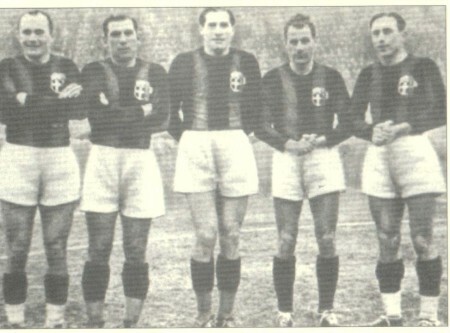 A second-place 1939-40 finish preceded Bologna’s sixth championship in 1940-41. Reguzzoni and Puricelli starred as Bologna beat Inter and Milan to the Serie A title, but this season will always be remembered more for non-footballing reasons than Bologna’s sixth Scudetto. Benito Mussolini had declared war on France and Great Britain weeks after the previous season’s end. Mussolini insisted football continued as a means of propaganda, but there was an understandable sense of unease throughout the campaign. Nonetheless, Bologna overcame Fiorentina’s early-season dominance to win the title by four points, with the Viola eventually falling to fourth. The seasons that followed were fruitless for Bologna, as the Emilia club finished seventh and sixth in 1942 and 1943. Serie A was eventually suspended in 1943 as Italy’s involved in World War II intensified, and that’s where I’ll pick-up tomorrow. I still can’t believe that Bologna were so dominant during this time period. As I said on Monday, I’d assumed they were no more successful than Palermo or Udinese, but it looks like I was hugely wrong. I knew a thing or two about the early successes of Pro Vercelli, Torino and Genoa before starting this blog, but I had no idea about Bologna.